I have always been a perfectionist, and choosing wedding flowers can be such a difficult decision, especially if you don’t have a wedding planner. There are just so many options. Because I’m a paper crafter at heart, I love dreaming up all the beautiful ways you can incorporate paper flowers into your wedding scheme to make your event both elegant and affordable. Paper flowers can be used in your wedding bouquet, backdrops, centerpieces and cake decor — and the list goes on! Here are just a few ideas on how to personalize your paper flowers to create your perfect special day. Adding a few paper flowers to a fresh bouquet can create beautiful visual texture and allow you to play around with some flowers that might not be in season. Last summer, I helped design a lush English garden–themed wedding with a palette full of delicate creams and blush pinks. For the bridal bouquet, we combined some beautiful greens with blooming green hydrangeas and blush pink roses, then added cream peonies made from crepe paper. The crepe blended perfectly with the texture of the eucalyptus and dusty-miller pieces, and the bouquet turned out gorgeous! Making a bouquet with paper can allow you to incorporate colors you might not be able to find at the flower shop. Create a whimsical bouquet while still maintaining an elegant look by using beautiful and delicate crepe paper and mixing in golds or coppers. The extrafine crepe will resemble the graceful fragility of real flower petals, while the metallic accents will give the appearance that you stepped right out of a fairy tale. Lovely! The benefit of using paper to create a wedding bouquet is being able to have more control over the look of your blooms. I often like to print a watercolor wash over my paper when I am making the flowers. It makes them look almost like a work of art! The texture of the watercolor reflects the light and creates a gorgeous subtle effect. This simple but elegant bouquet of roses could easily be used for wedding centerpieces and bridesmaids’ bouquets as well. You wouldn’t believe some of the incredibly impressive creations you can make with just paper. If you appreciate the look of an intricate and stunning bouquet, you can handcraft each flower for a truly unique arrangement. Queen Anne’s lace and dusty miller are very popular pieces of filler greenery for wedding bouquets because of their feminine leaves. Incorporating a wide variety of blooms adds to the complexity and makes for an extremely special and aesthetically interesting arrangement. This particular bouquet features ranunculus, dahlias, succulents and hydrangeas with a muted rustic color scheme that works well for weddings in any season. Some of the most classic wedding arrangements include roses, hydrangeas, calla lilies and freesias, as the beautiful blooms and long stems make them great for adding to arrangements. Build your own arrangement using some of these as a foundation, and then create a unique variation by making some (or all!) out of paper. Use a crisp white and vibrant green to make a gorgeous and bold contrast with crepe-paper calla lilies, or try soft metallic text-weight paper for your freesias to mix a pop of shimmery color. Not only will your lovely bouquet be one of a kind, it will also last forever. 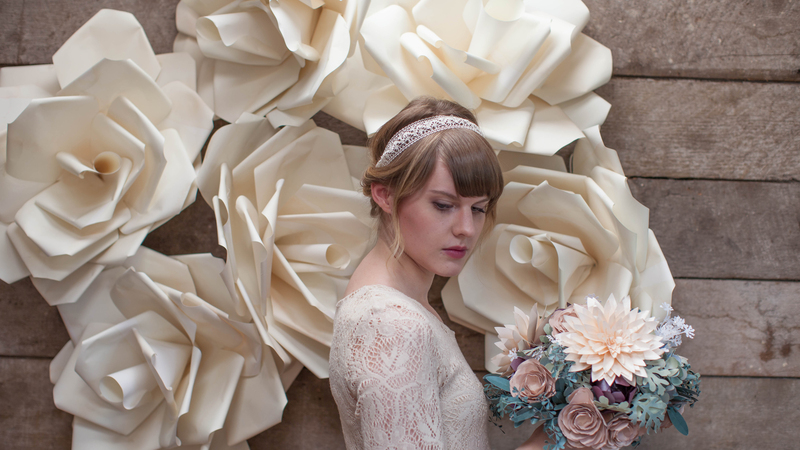 Outside of bridal bouquets, paper flowers can be used to make exquisite wedding backdrops. Use simple store-bought food coloring to create flowers that match any color scheme. Play around with making jumbo roses and blooms! A wedding backdrop using paper flowers adds an eye-catching yet delicate feature to your event that both you and your guests can enjoy in photos. You can even add some of your jumbo blooms to the dance floor or table settings to create a cohesive look. There are so many ways to incorporate paper flowers into DIY wedding bouquets and decor. Using paper flowers in your wedding planning guarantees your bouquets and accents will be unique, special and customized to fit your exact vision. And of course, what better way to personalize your special day than to actually handcraft all the pieces in your event?